Rapahoe is a small settlement just 10 minutes north of Greymouth. It is a quiet community with under 50 houses and overlooks a magnificent beach. The settlement is situated on the West Coast, rated by Lonely Planet as one of the top ten scenic drives in the world! Rapahoe is on the boundary of the Paparoa National Park, which boasts native forest, limestone cliffs, caves and underground streams. The Point Elizabeth Walkway is situated right at your doorstep where seals and Hector dolphins play. A seal colony is also located on the rocks at the far end of the beach. The beach itself provides excellent stone-collecting possibilities, with greenstone often found, as well as opportunities for surfing. Rapahoe beach is one of the safest swimming spots on the Coast. Surf-Lifeguard patrol the beach most Sunday’s. 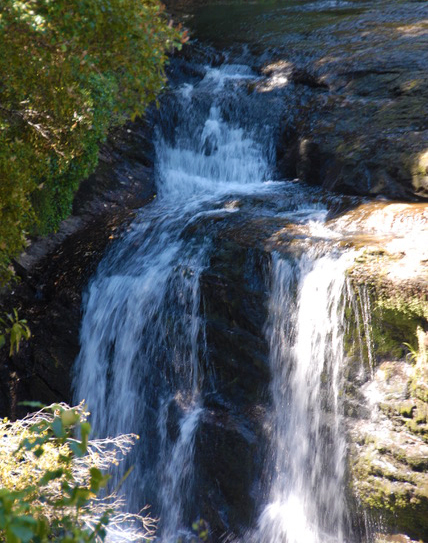 Coal Creek Falls is another fabulous walking track close by. Another spectacular track with native birds and real West Coast Bush. The Greymouth area is just 10 minutes south of Rapahoe and is the main business centre for the West Coast region. Greymouth and its surrounds offer visitors a wide range of outdoor experiences including Shantytown. There are quad bike adventures, mountain biking, caving, guided walks and tours, surfing, gold panning and much more. Monteiths Brewing Company – You can taste craft beer, take a tour of the brewery and eat tapas in the Greymouth bar. You will also find jade and bone carving galleries, art galleries and museums. Supermarkets, or check out the local cafés and restaurants in the main centre. 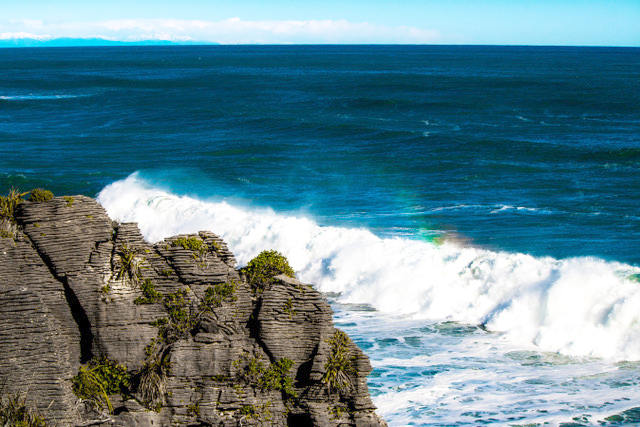 Punakaiki is most famous for its Pancake Rocks and Blowholes – both of which are spectacular. They are formed by the weathering of layers of limestone which are quite unique. There are also tracks that lead through the native rainforest so that you can experience the native flora in more detail. A large number of forest birds such as Tui, Bellbird and Kereru (New Zealand pigeon) migrate seasonally between coastal and upland forests.